ROME — The opportunity to ask an extremely competent person about the creation of the world, the possibility of alien life or whether to follow both science and faith does not present itself very often. 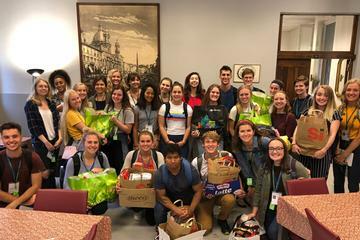 However, the students of St. Thomas University participating in the Rome-based course on Global Christianity got this chance at The Lay Centre Nov. 20, thanks to Jesuit Brother Guy Consolmagno, director of the Vatican Observatory. Brother Consolmagno was born in Detroit, Michigan. He obtained his Ph.D. in Planetary Science from the University of Arizona in 1978. He was a postdoctoral fellow and lecturer at the Harvard College Observatory, from 1978 to 1980, and for the following three years at MIT. In 1983, he left MIT to join the U.S. Peace Corps; he served for two years in Kenya teaching physics and astronomy. He entered the Society of Jesus in 1989, and went back to university, this time to study philosophy and theology. 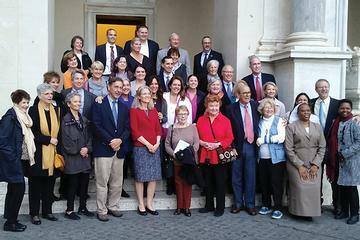 Since 1993, he has been working at the Vatican Observatory, which he now directs. 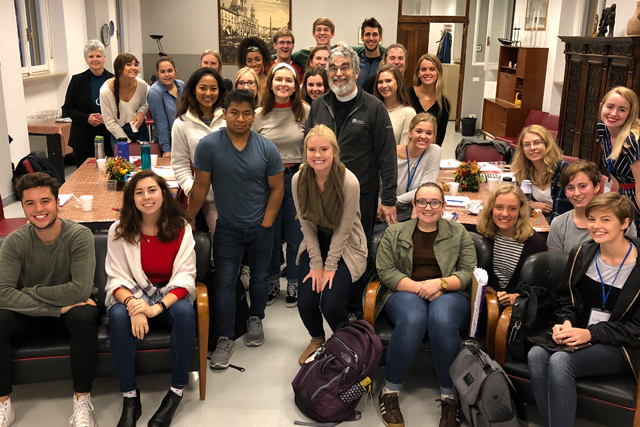 “I had a wonderful time when I was in college, and talking to college students reminds me of those days and it gives me the joy of being able to share what I got,” said Brother Consolmagno at the end of his two-hour talk with the St. Thomas University students. He led them through a presentation that showed the deep connections between astronomy and faith and challenged the idea many have that the Church is against science. During the second half of the 19th century, under the auspices of Pope Leo XIII, a new observatory was built in the Vatican. It was actually a political statement, affirmed Brother Consolmagno because the pope wanted to present the Vatican as an independent state and show that the Church was not against science. However, astronomy is not only about politics; rather it invites the human being to pray. “From no part of creation does there arise a more eloquent or stronger invitation to prayer and to adoration than looking at the sky,” said Pope Pius XI. His successor was even more explicit about the importance of studying the sky. “Man ascends to God by climbing the ladder of the universe,” said Pope Pius XII. “Studying the universe is an act of worship because it’s an act of getting closer to the Creator,” said Brother Consolmagno. “Scientific research can and should be a source of deep joy,” he added, quoting Pope Francis. Brother Consolmagno tackled many different questions, ranging from the calendar and its relation to stars and planets to the controversy of Galileo and Darwin’s theory. Students asked him many questions. He concluded by telling the story of creation in Genesis; he asked the students to think about its deeper meaning rather than look for scientific data. “Telling a story is a performance and every performance is a conversation, and ultimately science and theology are conversations,” he said. 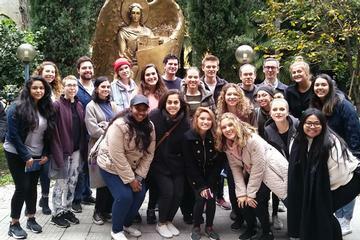 DePaul University students study "Religion in Rome"